NASA's Mission Management Team met briefly Friday to assess the initial progress of the shuttle Discovery's mission and review preliminary data about at least four debris "events" seen during the climb to space. It is not yet clear how many bits of debris might have hit the shuttle's heat shield, but all of the events occurred well beyond the timeframe where impacts can cause major damage. It will take several more days to complete the initial post-launch assessment, including analysis of detailed heat shield photographs that will be taken by the International Space Station's crew during Discovery's approach to the lab complex Saturday. But for now, based on a preliminary assessment, NASA managers are not concerned. The shuttle's external tank features two separate propellant tanks separated by a ribbed "intertank" section where the forward end of the ship's two solid-fuel boosters are attached. The lower tank holds liquid hydrogen and the upper tank holds liquid oxygen. The base of the upper liquid oxygen tank is supported by a massive flange at the top of the intertank. A similar flange at the bottom supports the top of the liquid hydrogen tank. Between the two flanges, 108 vertical stringers are used to strengthen the walls of the intertank. Discovery blasted off Thursday after a three-and-a-half-month delay to repair cracks in the upper few inches of stringers near the oxygen tank flange and to install modifications to prevent the formation of additional, potentially dangerous stress-relief fractures. MMT Chairman LeRoy Cain said Discovery's tank appeared to perform well during launch and that the area near the top of the intertank where the forward ends of 105 stringers were repaired or modified and refoamed had no obvious problems. 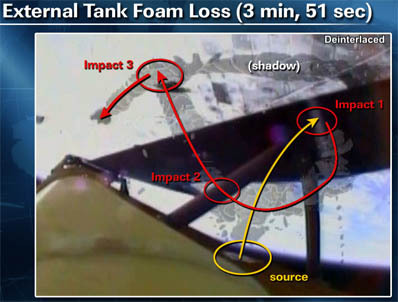 But several pieces of foam debris could be seen breaking away from the lower part of the intertank, where the lower ends of the stringers meet the flange at the top of the hydrogen tank. Based on post-Columbia analysis, engineers believe a phenomenon known as "cryopumping" can cause foam to separate from the upper area of the hydrogen tank. Air trapped in the foam first liquifies when the tank is loaded with liquid hydrogen propellant at minus 423 degrees Fahrenheit. During the climb to space, as the hydrogen level in the tank drops, the hardware warms up, the liquified air turns back into a gas and the pressure can cause overlying foam to pop off. Special care is taken during the manufacturing process to minimize the amount of trapped air that might be present in the foam, but cryopumping is a recognized -- and accepted -- risk. "This is in an area where we know we have susceptibility to what we call cryopumping," Cain said. "That's at the very top of the liquid hydrogen tank. When we get to this three- or four-minute time period in ascent, that part of the tank is getting relatively warm compared to what it had been. And so we get this cryopumping and from a physics standpoint ... we know we can lose foam as a result of this cryopumping phenomenon. So that was, we believe preliminarily, the cause of this foam loss. "This is an area of the tank that we're very attuned to in terms of the potential for this kind of debris loss," he said. "So we don't have any concerns about this event. Obviously, we'll do our normal vehicle inspections ... to make sure the vehicle is OK."
Debris impacts pose the greatest threat in the dense lower atmosphere, which rapidly slows lightweight foam. The accelerating shuttle can then run into the debris at a high relative velocity. After about two minutes and 15 seconds, however, atmospheric density is low enough that it no longer causes severe deceleration of the foam, resulting in much lower impact velocities. 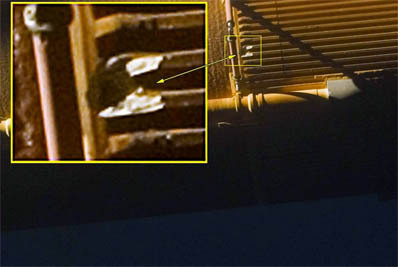 Cain said the timing of the releases was consistent with cryopumping and that a preliminary analysis of the camera footage indicated the debris swirled about in the zone between the tank and orbiter, possibly hitting the heat shield near the nose landing gear doors. But the impact velocity appeared to be very low and no obvious damage could be seen. "It took sort of a random path where it initially floated up, looks like it may have touched the underside of the orbiter there in the bipod attach region and then from there, it went and traveled back along the stack and doesn't appear to have impacted any other part of the orbiter," he said. Three other events were noted, including one that may not have been foam insulation. But they were all "well outside of the area of aerodynamic sensitive transport time and so we didn't see anything of concern in terms of debris loss from the tank," Cain said. "Overall, the performance of this tank, external tank No. 137, was really exceptional." The entire underside of the shuttle will be photographed with 400-mm and 800-mm telephoto lenses during Discovery's approach to the space station Saturday. If any problem areas are spotted, the shuttle crew can carry out a "focused inspection" later in the mission to collect additional data. NASA hopes to launch the shuttle Endeavour April 19 on its final flight. Endeavour's external tank has been modified like Discovery's to strengthen the stringers near the upper oxygen tank flange. Cain said as of now, he doubts any changes will be ordered for Endeavour's tank based on the results of Discovery's launch. But no final decisions will be made until engineers complete their post-launch assessment. "I do not anticipate that what we've seen in terms of performance on this tank would cause us to want to do anything different in the area of the LH2 flange on the upcoming two tanks," Cain said. "In fact, I would say, contrary to that, I think we'll look at the performance of this tank once all the data (are) in and it'll confirm what we think today, which is it performed exceptionally and it reinforces the modifications we did on the (liquid oxygen) flange area. So I think it'll reinforce the flight rationale we established to go fly this mission."